Listed below is additional information about specific grants. Click the title or ► to learn more. This scholarship program is a partnership among PCHF, Phoenixville Hospital, and Phoenixville Hospital Medical Staff. 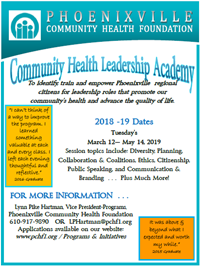 As a service to the community, the Phoenixville Community Health Foundation, together with the scholarship partners, is sponsoring the Greater Phoenixville Healthcare Scholarship Program that provides an $8,000 scholarship payable over four years to qualifying students pursuing a health-related career. The program is open to graduating high school seniors from the following schools: Technical College High School Pickering Campus, Great Valley High School, Methacton Senior High School, Owen J. Roberts High School, Perkiomen Valley High School, Phoenixville Area High School, Pottsgrove High School, Pope John Paul VI, Spring-Ford High School, and the Renaissance Academy. Additionally, residents of these school districts attending private or technical schools are also eligible. creative 500-word essay about what has lead you to pursue a health care career. Download the Application form and apply. The deadline is April 14th 2019! This Scholarship Partnership began in 2005 upon the opening of the Delaware County Community College’s Chester County Campus in Downingtown. Because Chester County is not a “sponsoring” district of DCCC, County residents enrolling at the college pay double the tuition cost of Delaware County and sponsoring districts’ students. The Foundation’s goal is to act as a sponsor for residents of the Phoenixville Area School District by paying half of their tuition. In 2007 the scholarship program was modified to support only students majoring in health-related or public safety programs. To access the scholarship, no application is necessary. At the start of both spring and fall semesters, a listing of all residents of the Phoenixville Area School District attending any of the College’s nine campuses is obtained from the Registrar and reviewed for appropriate majors. At that time, scholarships equivalent to one-half the tuition of residents is applied to their accounts. This is an on-going scholarship initiative. This Scholarship Partnership began in 2013 for students majoring in a health-related or public service curriculum. Because Chester County is not a “sponsoring” district of MC3, County residents enrolling at the college pay double the tuition cost of Montgomery County. The Foundation’s goal is to act as a sponsor for residents of the Phoenixville Area School District by providing a tuition subsidy. To access the scholarship, students need to contact the Financial Aid Office. Once qualified, scholarships of up to one-half the prevailing per credit hour cost for out-of-County residents are applied to their accounts.